I’ve never been to Poland (yet! ), but I’ve tried bigos in several Polish restaurants, and it’s always run the spectrum between slightly and vastly disappointing. Karczma and Krolewskie Jadlo in New York each serve a version that is decent but simple and uninspired, with only one kind of meat. The stew at Yellow Bench in Edinburgh, with knackwurst and tiny chunks of meat, was worthy of a Cold-War era Polish truck stop. I have it on good authority (from authentic Poles who live in Poland, if you must know) that this is not what a good bigos should be like, and that Polish cuisine nowadays can be much more sophisticated than that. So I’ve tried to capture the spirit of the dish and come up with a modern interpretation. There a fairly classical bigos at the center of my recipe, with venison and an intense cabbage taste (if I do it again, I could try to add plums and fried onions). I dare say without bragging that it tastes better than the ones I’ve tried elsewhere, and you can make it on its own if you don’t want to spend your whole weekend in the kitchen. 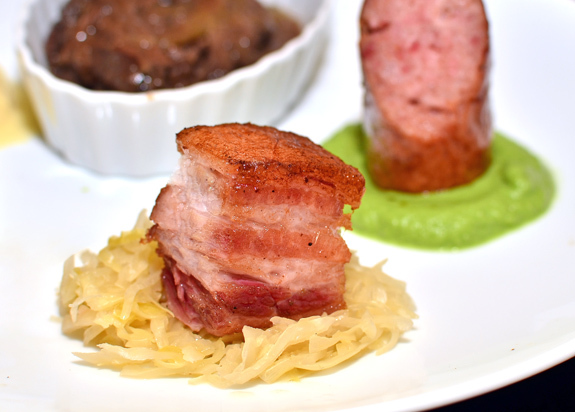 But then, there are also four other elements that play on variations of the cabbage-meat theme, with other typical or occasional bigos ingredients: kielbasa, pork belly, mushrooms, apple, caraway, and more. Keeping these elements separate instead of making one “big mess” allows one to preserve clean, distinct flavors, and offers a profusion of smaller ingredient groupings, such as sauerkraut-apple-blood sausage. The pork belly sous-vide recipe is inspired by Thomas Keller’s Under Pressure: Cooking Sous Vide, a must-have for all the sous-vide geeks, which teaches — among other things — that not everything needs to spend several days in a water bath to come out great. Not having time to make my own kielbasa and kiszka, I got some from the East Village Meat Market. They were excellent. Place the water, salt, curing salt, sugar, black pepper, and cumin in a blender, and process for a few seconds. Transfer to a bowl, add the pork belly, cover with plastic wrap, and marinate for about 12 hours. Take the pork belly out of the brine, and vacuum-seal in a sous-vide pouch. Cook in a 82 C / 180 F water bath for 12 hours. Reserve. Cut the venison into 5 cm cubes. Season with salt and pepper. Heat half of the canola oil in an oven-proof pot over high heat. Add the venison, and sauté until brown on all sides. Reserve. Brown the bones in the same pot, and reserve. Add the rest of the oil, and sauté the onion, carrot, celery, and cabbage until golden brown. Stir in the tomato paste, and cook for a few minutes, stirring constantly. Mix in the venison meat, bones, parsley, bay leaf, and juniper berries. Add the red wine, and simmer for a couple minutes. Add the water, and bring to a boil. Cover with a lid left ajar, and cook in a 120 C / 250 F oven for 4 hours. Let cool. Take the meat out of the pot, discarding the bones. Pass the liquid and vegetables through a chinois, pushing with a ladle to extract as much stock as possible. Transfer the meat and stock to plastic containers, and refrigerate until cold. Discard any fat that has solidified on the surface of the venison, and separate the meat from the stock. In a pot over medium heat, sauté the cabbage in the oil until golden brown. Season with salt and pepper, add the stock, and reduce by 1/2 to 2/3. Whisk in the butter, add the meat, cover, and cook over low heat for about 30 minutes. In a saucepan over medium heat, sauté the cabbage in the olive oil until soft. Season with salt, add 3/4 of the stock, and reduce until dry. Blanch the spinach in boiling water, then drain and squeeze lightly. In a blender, process the cabbage and spinach with the butter and the rest of the stock. Rectify the seasoning to taste, pass through a chinois, and reserve. Rinse the sauerkraut in a sieve under cold water, then drain well. In a saucepan over medium heat, sauté the apple in the butter until golden brown. Add the sauerkraut, caraway seeds, and chicken stock, and simmer over low heat until the liquid is almost completely reduced. Transfer to a blender, add the cream and salt, and process until smooth. Pass through a chinois, and reserve. Place the sauerkraut, juniper berries, Riesling and stock in a saucepan. Cook over very low heat for 15 minutes. Reserve. Prick the sausages (both kielbasa and kiszka) with a fork, place in an oven-proof dish, and cook in a 175 C / 350 F oven for 10-15 minutes, until hot. Cut each sausage into six pieces. Place the whole clusters of maitake mushrooms in another oven proof dish. Top with the butter, and season with salt. Bake in a 175 C / 350 F oven for about 15 minutes, until cooked through. Take the pork belly out of the sous-vide pouch, and cut into six cubes, about 4 cm each. Sauté briefly in a pan over very high heat with a little bit of canola oil, until brown on all sides. 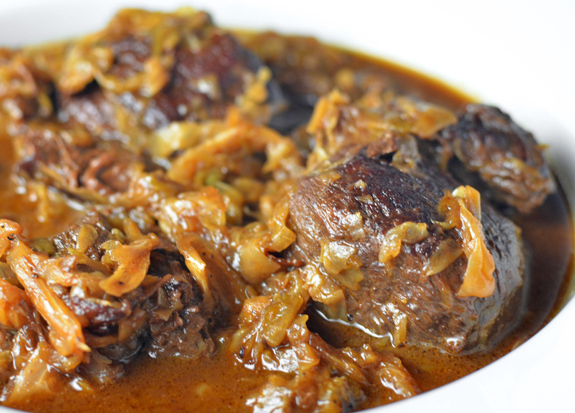 In separate saucepans, reheat the venison bigos, cabbage-spinach purée, apple-sauerkraut purée, and sauerkraut. 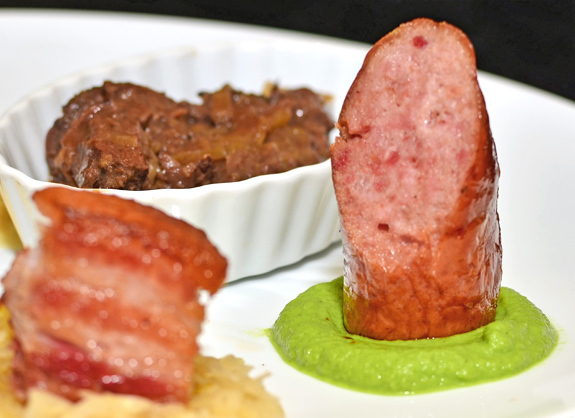 On each plate, place a piece of kielbasa on a bed of cabbage-spinach purée, a piece of kiszka on a bed of apple-sauerkraut purée, a piece of pork belly on a bed of sauerkraut, a small cluster of maitake mushrooms, and some of the venison bigos in a small ramekin. Serve immediately.